A former user, now patient, looking out over the wall from the Dukahtawng detox center. In Kachin state, northern Myanmar, one person in every household is addicted to heroin, an extremely addictive drug derived from the poppy plant common to the mountainous regions bordering both China and Thailand. This area is known as the “Golden Triangle” and includes parts of Myanmar, Thailand, and Laos. It has been one of the most extensive opium-producing areas in the world since the beginning of Myanmar’s civil wars in the 1950s. According to the United Nations, at least 200,000 households in Myanmar alone are currently involved in the cultivation of poppy plants. To add to the complexity of the region it is also widely believed among the Kachin people that the Myanmar military, also known as the Tatmadaw, is working with the poppy farmers and dealers in the area, at times, even protecting them. Drug production in Myanmar is not a new phenomenon. In 1948, after British rule was handed over to the Burmese, ethnic minority groups declared independence from the newly formed government. Refusing to accept the succession states, armed groups formed across the country. The ensuing conflicts have certainly fueled the drug trade, with various armed factions (including the Tatmadaw) fighting to control it. The consequence of this has often resulted in mass displacement and forced evictions of civilians. The most serious fighting has taken place in the resource rich Kachin state, between the Kachin Independence Army (KIA) and the Tatmadaw, which began in 1962. The Kachin, being mostly Christian, have long fought the government for the right to self- rule and a separate state within Buddhist majority Myanmar. Despite the extremely unstable political situation, Kachin state was able to enjoy a period of uneasy peace during a 17-year ceasefire, which collapsed in 2011. Since then, over 120,000 civilians in Kachin and neighboring Shan state have been displaced. Around 30 men gather on the bank of the Irrawady river around sunrise in Myitkyina to shoot up before the day begins. Photo by Josh McDonald. Pat Ja San claims to have over 100,000 members and to have cut down over 6,000 acres of poppy plantation as of May 2017. However, the main motivation of the group is to detox drug users. After a drug user is picked up, they spend ten days in what Pat Ja San refers to as the “cell.” The cell is for new arrivals, as they are most likely to attempt to escape due to withdrawals. Up to 15 people can share one cell, which has its own toilet and washing space. They are kept entirely separate from the rest of the detox center. 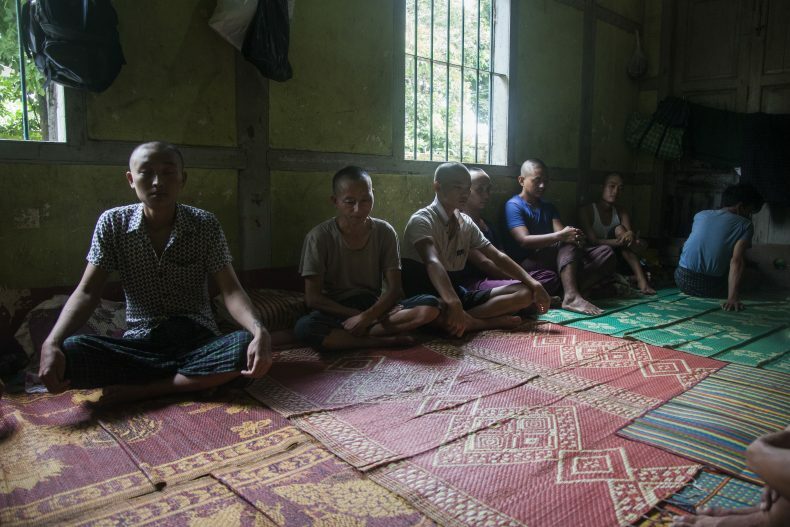 At the Maw Hpwng detox center an hour outside of Myitkyina, seven men are being held in the cell. The effects of heroin use and withdrawal are visually noticeable on their faces and bodies. The men are from the same village and have all grown up together; two of them had already done six months at the center, but were released only to get caught taking the drug again. 21-year-old Waw Wu arrived four days ago. The last time he injected heroin, he was caught and brought straight to the center. “My whole body aches; I can’t stop shaking,” he said. Others described having abdominal pain, muscle spasms, severe sweating, diarrhea, and intense anxiety. Another man in the cell who had just arrived injected himself only a few hours ago. After 10 days in the cell, patients are allowed to enter the rest of the center, where they will spend another six months. Although still unable to leave the compound, they have a lot more freedom than in the cell. The Hpwng center currently has over 140 patients, sleeping in two large hostel-style rooms. It has a vegetable garden, livestock, and a makeshift gym. During my visit, the patients were participating in a singing competition. Most centers have some form of activity to partake in: fan making, gardening, and one center in Myitkyina even invited me to watch a game of football against another center in the area. Over 100 people from the surrounding neighborhood came to watch the match. “It’s good they can come here and play soccer with the rest of the community,” an elderly man said while watching the game. “I think a lot of people don’t trust the drug users. This is perhaps a way to regain their trust” At the Dukahtawng center, patients are occasionally allowed to work at weddings and funerals taking place in the church adjoining the center. As Pat Ja San was formed through a coalition of church groups, religion is certainly a main aspect of the detox; patients would study the Bible for up to seven hours a day. At the Dukahtawng center, there are 38 patients, 12 of whom were new arrivals. During my time there, they were kept in a locked room; some with chains on their ankles, and a man at the end of the room with his feet in a wood lock. The international community and the Myanmar government have heavily criticized Pat Ja San for their methods. When questioned on this, Tang Gun, reassured me that the Kachin people support them. “It’s common even for people to report members of their own family to us,” he said. “We change people’s behavior, physically, mentally and religiously.” Former users who have recovered would sometimes stay at the centers to encourage new arrivals to do the same. With a pastor and a priest at the center too, patients share courage through the Bible. A group of men locked in the “detox cell” at a Pat Ja San detox center in the village of Maw Hpwng. The cells are meant for new arrivals; they usually spend up to ten days locked inside. Photo by Josh McDonald. Moe Thein, a 30-year-old from Myitkyina, was arrested by police for dealing drugs. He served a seven-year sentence in Tamu City workers prison over 900 kilometers away in Chin state and later transferred to Mandalay. He was often starved while in prison, and witnessed many ethnic-driven killings. He was released from prison in February 2017, only to start taking heroin himself. His family, fearing he may be sent away to prison again, contacted Pat Ja San. Moe Thein spoke to his father a few days ago and said that if he’s better when he gets out of detox, perhaps he could take over the running of his father’s shop. If the local police arrest someone on drug charges, they could be imprisoned for up to 24 months. It’s also quite common that, like Moe Thein, they’ll be forced to serve their sentence in other areas of Myanmar, where they can face discrimination for their ethnic origins. Many families who fear their loved ones may be sent away from home would prefer to have them kept at one of Pat Ja San’s 94 detox centers around Kachin and northern Shan state. Pat Ja San records show that 7,334 users were held in their detox centers between April 2014 and April 2016, some as young as 14 years old. Any drug dealers caught by Pat Ja San are usually handed over to police rather than being sent to one of their detox centers. Dealers don’t require the same treatment as a drug user and are in fact working against Pat Ja San, in trying to eradicate the drug. However, there are exceptions. In the only center that houses both men and women, 27- year-old Nu Tawng from neighboring Shan state was caught selling drugs in Myitkyina on December 7, 2016. She had just moved to the city to support her family back home, and it was her first time dealing. She pleaded to be taken to a detox center instead of being handed over to the police. In exchange for this she would volunteer for two years. Nu Tawng put in a request to visit her husband and three children in her home state, but she’s yet to receive a reply. As Pat Ja San is a non-state group, they don’t have the authority to detain anyone or conduct raids on poppy plantations. This has led to armed confrontation with farmers and government-backed militias, and at times tense standoffs with the police and the Tatmadaw. In February 2016, the military command and the Kachin police agreed to cooperate with Pat Ja San and eradicate poppy plantations on the Chinese border. 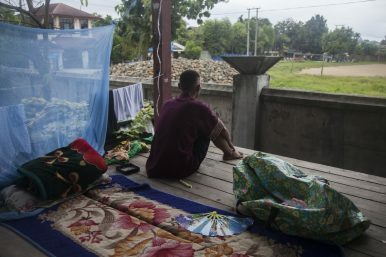 When Pat Ja San tried to enter the area, they were blocked by the Tatmadaw, who said they had halted the operation because local farmers said they would respond with violence. This led to a weeklong stand off between hundreds of Pat Ja San activists and the military. The Kachin police stayed clear of the standoff despite their support for Pat Ja San, as they are ultimately under the Tatmadw’s control. The case was later put in front of parliament, who voted in overwhelming support of Pat Ja San. Several men being held in a locked room at the Dukatawng Center. Photo by Josh McDonald. There are conflicting issues within Myanmar’s government and military, with some members supporting Pat Ja San while others are involved in the drug production. Myanmar is ranked 136th most corrupt out of 176 nations, according to Transparency International. Whilst many politicians support the eradication of heroin, they don’t support Pat Ja San’s methods, which have been criticized heavily after a video circulated of a Pat Ja San member flogging an addict. Despite sometimes having permission from the military, raids have become increasingly dangerous. Farmers have used grenades, assault rifles, and even traps to deter Pat Ja San raids. In early 2016, Lahtaw Tsai, a 19-year-old boy, was shot dead during a raid on the Indian border. He since become an icon among Pat Ja San members. Several detox centers have his picture hanging on the wall. The core reason some military officials become involved in the drug trade is due to the “easy money” they can receive. This is also the case for the Border Guard Force. In an area known as Zi Chyun, on the outskirts of Myitkyina, Pat Ja San was tipped off about a drug dealer and arrested the man. While transporting him back to a Pat Ja San center, the convoy was stopped by armed villagers who demanded that the prisoner be released. It’s believed that the area is mostly inhabited by the border guard force, who refuse to cooperate with Pat Ja San as they directly profit from the drug trade by turning a blind eye. According to Tang Gun, most of the poppy is grown in “black areas,” which are restricted zones that are not only common in Kachin state but across the country. With entry virtually impossible for media, NGOs, and activists, it seems these black areas serve as a safe spot for the state’s illicit activities. Similar to the drug trade, corrupt military elites and various armed militias control the vast production of gold, ruby, timber, and rubber. The most favored among the conflict minerals is jade, with the world’s most valuable jade found in the Kachin hills. In 2014, Myanmar’s jade production was estimated to be as high as $31 billion according to Global Witness, an organization that investigates the misuse of revenue from natural resources. That figure amounts to almost half of Myanmar’s total GDP. With peace talks taking place between Aung San Suu Kyi’s new civilian government and the Kachin Independence Army, there is a chance to stabilize the region. However, with the overwhelming evidence of corruption within the state, and the international community’s focus squarely on other parts of Myanmar, it remains unlikely that there will be any major changes to the growing heroin epidemic in Kachin state. Josh McDonald is an Australian photographer and journalist.